Last year, foreign secretary-level talks were cancelled days before they could start for exactly the same reason. It’s normal for Pakistani leaders and representatives to interact with Hurriyat leaders whenever they visit India. Previous Indian governments used to hardly take notice of these meetings. For Islamabad, the pro-Pakistani separatists are the real representatives of the people of India-occupied Kashmir. But Indian Prime Minister Narendra Modi has taken an unusually tough line on such meetings, thereby giving the Hurriyat a greater-than-normal importance in India-Pakistan relations. In Kashmiri politics, the Hurriyat group is a marginal player and does not enjoy widespread support. It is widely believed that they are funded and sustained by Pakistan and any leader who has tried to defect or take a line different from the established pro-Pakistan line in the group is purged. Most Kashmiris do not subscribe to the separatist political line and, therefore, they remain at best a fringe voice in the valley. Analysts say that by sacrificing India-Pakistan talks on the issue of the Hurriyat, the Modi regime is in fact helping the fringe group gain the sort of popularity it never enjoyed. 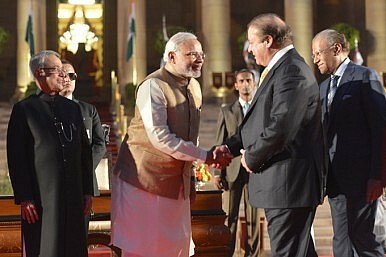 When Modi invited his Pakistani counterpart, Nawaz Sharif, to his inauguration in May 2014, it was hailed as a grand gesture and a paradigm shift in India’s approach to its traditional rival. But the bonhomie was just for optics and did not represent a well thought-out strategy. The Indian government was aware that Islamabad had not changed its stance on meeting with Hurriyat leaders, even after the cancellation of foreign secretary-level talks last September. Why then did it agree to start fresh talks? The Indian government has not come out with any clear answer. A lack of engagement between the two important South Asian neighbors is very disquieting. The current vacuum has given rise to new jingoism and further entrenches prejudices on both sides. What is disconcerting is the rabid voices of the media on both sides of the border. Adding fuel to the fire are the TV stations, which lose all sense of balance and become fronts for both governments. Their debates shrink the space for moderate voices to rise in both countries. Engagement is important to create a strong drive for peace in both countries, which are ultimately the stakeholders of stability in the region. That is why there is no alternative to talks.